A few years ago I put together a bag at the beginning of summer and kept it in the car with some of the summer essential items. My thought was to be as prepared as possible for any spontaneous outings or opportunities that arise. You just never know when you get a phone call inviting you to go swimming or play at the park. There have been a few times already this spring that I have found myself wishing I had already put together the bag, especially since I no longer carry a diaper bag or other “just in case” stuff. If you are going to put together your own bag here are some of my essential items and then others you can choose to add. 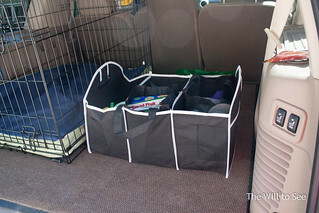 Sunscreen, hats and sunglasses – These should probably be in the car year round, but they tend to add clutter. Water (or water bottles) and non-melting snacks (like goldfish, craisins, pretzels or non-chocolate granola bars) – Even though we don’t tend of have the warmest of summers, my car will still get hot enough to melt anything with chocolate. Change of clothes – You never know when a spontaneous water fight might break out. I usually have a complete set for each boy, including socks and underwear. Hand sanitizer and wipes – These will always come in handy. Flip flops or crocs – Just in case shoes get wet. 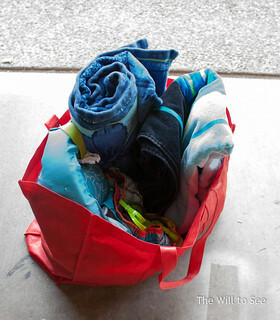 Swimsuits, towels, goggles and life jackets – These may get to big to just keep in your car, but having a bag packed in your garage or storage closet will help for quick getaways. Sports equipment – soccer ball, basketball, kick ball or Frisbee for stops at the park. Picnic blanket or camp chairs – Some parks don’t have benches at all the points where the kids want to play. This way I always have the ability to be comfortable. Once you have decided what is going to go in your bag, collect the items and decide how big your bag needs to be. I love using a big bag with compartments so things stay organized and easy to find. If you can’t find a bag like that then use Ziplocks or small containers to keep things separate. Now you are all ready for anything summer might have in store. I would love to hear if you have suggestions on other things to go in the bag. Love this. Great idea. 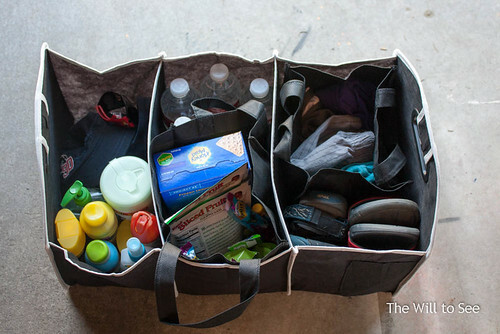 I’m still in the diaper bag days but I love the idea if doing this later. I usually do a similar thing with all the beach gear every summer- including toys. Then I don’t have to spend do long packing. Love this post.